Two of the biggest companies doing retail business in Canada are at war with each other: Visa and Walmart. Most Canadians have not noticed, though, because the war is taking place only in select markets. However, if the current trend continues, it could be -- as the slogan goes -- coming soon to a store near you. Walmart is famous for beating down supplier prices on everything from clothing to home furnishings. That's its business model, that's what it has to do to appeal to its core market. "Canadians deserve better than paying a hidden fee that is four-times higher than consumers pay in other countries." Back in May, negotiations broke down between the two companies. Walmart announced that it would phase out Visa payments in all its stores across the country. That phase-out began in Thunder Bay, where Walmart has three stores. Thunder Bay? Could Walmart have chosen a more secluded spot? 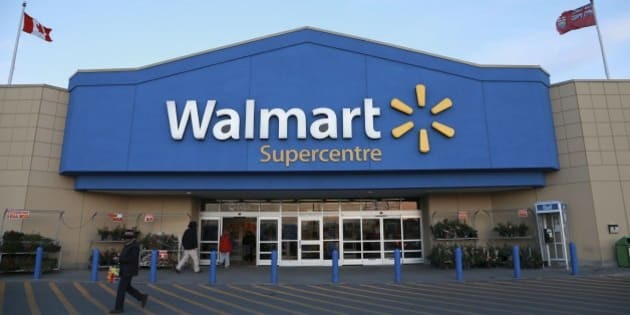 If Walmart had started with Toronto, that would have been like dropping a retail nuclear bomb. This is more of a pressure tactic, like saying to Visa, "We are serious. Come back to the table. Give us a better offer." "Until an agreement can be reached in this commercial dispute, we encourage shoppers to use their cards at the more than 5,200 stores in Thunder Bay that accept Visa." And the cold war settled in...but not cold for long. Walmart upped the ante, in what is increasingly looking like a game of chicken. As of October, Visa is no longer accepted in its Manitoba stores. Again, a somewhat contained location, but definitely a bigger prize to squabble over than Thunder Bay. In a clever move that reminds me of an arms escalation, Visa jumped in to hit Walmart where it hurts. In those select locations -- Manitoba and Thunder Bay -- Visa is offering a $10 rebate on groceries. Obviously, since Walmart is not accepting Visa, people will have to shop elsewhere to take advantage of the $10 rebate. So much for Walmart's attempt to become Canada's largest grocery retailer. Still, the question must be asked: how far can Walmart take this game of chicken? A one-time $10 rebate is unlikely to make a long-term dent in sales. But refusing people's credit cards is another matter. Credit cards are not people's preferred method of payment. I am part of the majority. When I show up at a store or gas station, I use my debit card. Still a lot of people rely on credit cards. And cash is not always an option for larger purchases. Walmart says it pays $100 million annually in credit card fees. By refusing Visa, Walmart will save money on credit card fees. It will increase purchases made on its own credit card, presumably at a nice profit and presumably appealing to its most loyal customers. "It is damn annoying that Walmart issues cards that often do not even work! I have thousands of dollars available on my Walmart credit card, yet get declined when trying to pay for a purchase at their stores. My Visa works everywhere, and I have no issues with it, yet I am unable to use it at Walmart because of this asinine 'rule'." The average Canadian has 2.2 credit cards in their wallet. In most cases, only one would be a Visa card. What we don't know is how many Walmart shoppers have only one credit card, a Visa card, and feel that paying any other way is a big enough inconvenience to drive them away from Walmart for at least some of their purchases. The big question is whether Walmart will save enough on credit card fees and gain enough in usage of its own credit card to offset the customers that decide to shop elsewhere with their Visa cards. That might be the same question Walmart Canada executives are asking. In fact, that might be why they are phasing out Visa cards at a snail's pace, collecting data and analyzing the implications first from a small market, then from a slightly larger market. If Walmart backs down, it will be because they are losing more money than they are saving. By upping the ante from Thunder Bay to Manitoba, we can surmise that going Visa-free in Thunder Bay was most likely profitable. If six months from now they refuse your Visa card in Mississauga, you'll know that Walmart doesn't really need Visa all that much. The real game of chicken might not be between Walmart and Visa. It might be between Walmart and its customers.